Alex Vachev comes from Sofia, Bulgaria. As a professional dancer he was Ballroom and Latin dance champion and prize winner in numerous international competitions and championships. His career as choreographer and teacher has taken him around the world and he has worked for some of the most popular TV programs such as Dancing with The Stars, So You Think You Can Dance, The Voice many others. After living and working in Europe and USA, Alex moved to Vietnam where he continues to work as a choreographer and dance teacher. 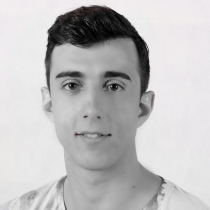 After more than 17 years of professional dance experience, Alex has mastered the techniques of couples dancing and is able to pass those on to his students while creating a fun and easy-to-learn atmosphere.